We are now nearly at the mid point of the year, which is time for a sewing celebration. 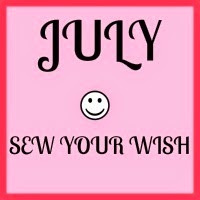 So this month, why not sew your wish - that garment you have always wanted to try, maybe something that you think is not you but you wish it was, or just something your heart desires. I also want to let you know that I will be away for a couple of weeks in July so I won't be able to post photos to the monthly gallery. Don't worry, I will post them all when I get back. In the meantime, I will be keeping in touch with you all with my mobile devices. Already have a few items cut out, and am waiting on a vintage pattern to arrive in the mail that I may have to sew first (so many ideas floating in my mind on how to make this pattern). Have a safe and wonderful trip Sarah Liz. Isn't that always the way with sewing ...more ideas than time. Looking forward to seeing your vintage pattern. Wish... I wish I was a faster sewer & could get to some of the patterns I've been meaning to make for a long time! I've joined PR's "Pattern Stash" contest so between the two I am hoping/wishing to get some extra sewing done in July! I do like your wish - I think a few of us probably secretly share it - and also I think it would be nice to have lots more time to sew. Good luck with the pattern stash contest - it's good to work the two challenges together. I'll have to look out for you on the PR challenge - do tell us about it when you have finished it. Hope you have a wonderful trip.. Enjoy yourself.. I am excited about the July theme. I will post my plans soon. I am already working on a July idea. Have a great break. What a great theme you have set this month I have gots lots of ideas but need to finish June first and taking into account a busy month at work I think I am going to have to be a bit realistic about what I can achieve In a month. Half way through the year all ready and I have some lovely new clothes and improved sewing skills. That you for hosting this challenge I am thoroughly enjoying it and appreciate all your efforts. Thank you Tracy - and don't worry too much about the July deadline - sew your wish when you have time - sometimes we do have busy periods that interrupt our precious sewing time. Have a lovely time. I'll have to my thinking cap on! Okay. YOU be careful and take care!